Over the years, often as a result of my work as the 009 Society's Publicity Officer, I have been honoured to come into contact with some excellent and in some cases very historic 009 models, and have been able to photograph them 'at work' on the railway. I am very grateful firstly to their owners for giving me the opportunity of photographing these models on the L&TR and secondly for their permission to include these photos on the website. Many of these photographs were taken in black & white because at that time this was the most convenient medium for reproduction in the 009 News. 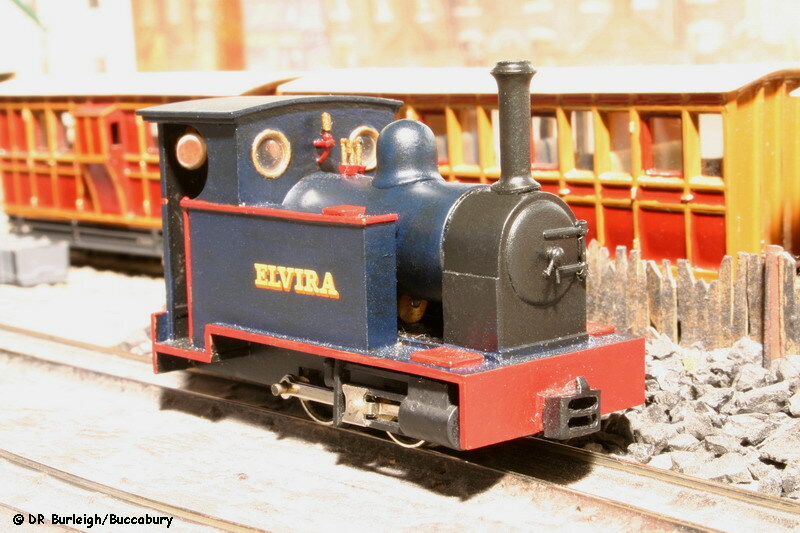 One of my stalwart supporters during my time as 009 Society Publicity Officer was Dr. Stephen Sullivan, who always loaned me his models (usually his latest creations) for the showcase at the International Model Railway Exhibition at the Horticultural Halls in Westminster. Stephen usually also let me hang on to them for a couple of shows as well as the Society AGM, for which I must express my grateful thanks. © DRB/Buccabury The 0-4-0+0-4-0 Backwoods Tasmanian Garratt K1 on a down goods arrives at Rhyffedd Coed to cross an up passenger train, the motive power for which is another famous Garratt, the Darjeeling 0-4-0+0-4-0 built by David Mander. © DRB/Buccabury The Backwoods Tasmanian 0-4-0+0-4-0 Garratt K1 crosses the stream on its final approach to Mynydd-yn-Bwlch with an up passenger train. 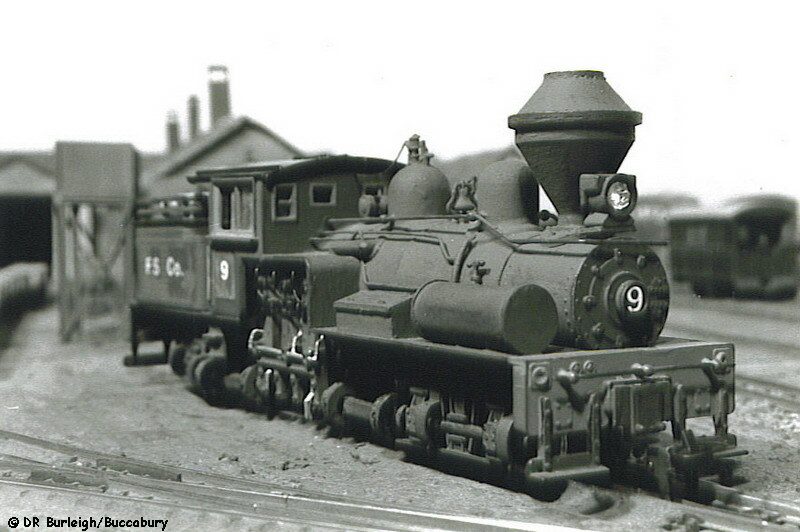 0-4-0ST No.21 © DRB/Buccabury A rare Merlin Models 'Maverick' 0-4-0 saddle tank on a Joe Works chassis hauls three Roco wagons and a Joe Works Minilands caboose across Bryn Mawr. 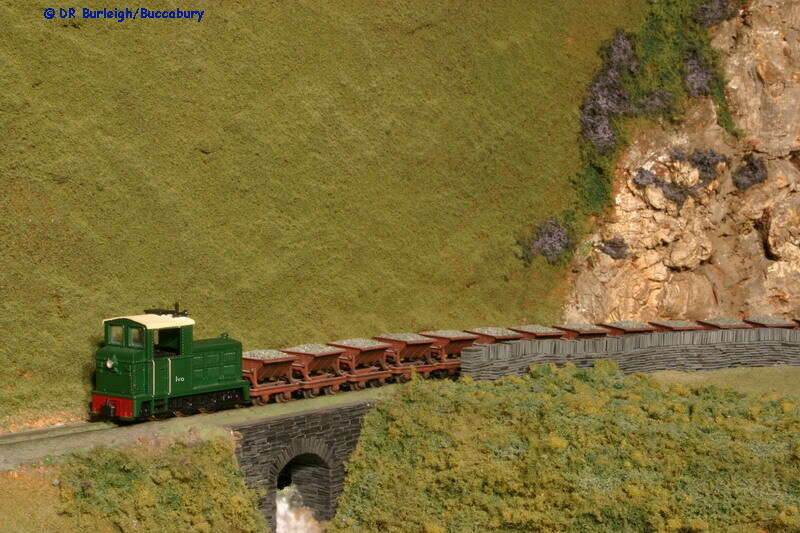 Forney No.23 © DRB/Buccabury No.23, a Joe Works 2-4-4 Forney trundles along under Cefn Glas with the Joe Works Minilands compo coach and the caboose. Otavi Railmotor © DRB/Buccabury The Backwoods Otavi Steam railcar departs Rhyffedd Coed carriage first on its way back to Llanmynach. The smoke in this and the preceding photograph was produced by using cotton wool which was moved during the exposure. © DRB/Buccabury The unique Sand Hutton Railway coach is taken for a trundle on the lower reaches of the L&TR by one of the Hunslet 0-4-0 well tanks. 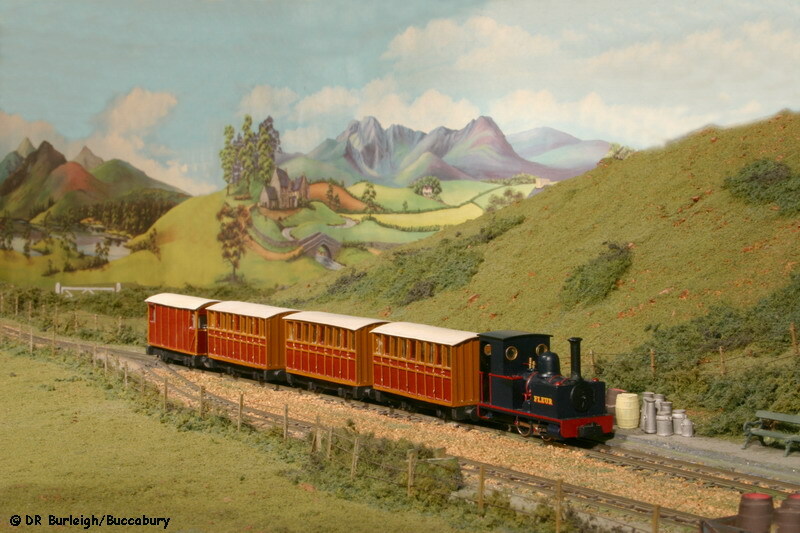 © DRB/Buccabury The Welshpool and Llanfair Light Railway's 'Sir Drefaldwyn' crosses the old drover's road with the up morning passenger train. 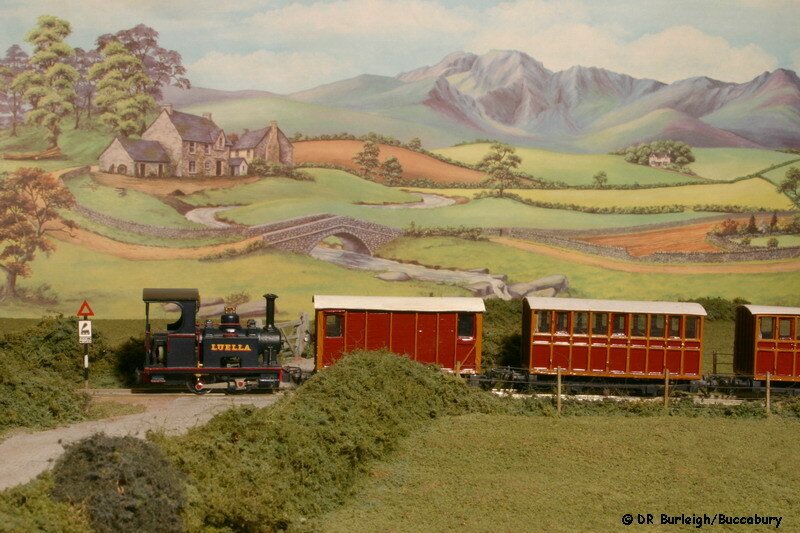 © DRB/Buccabury Hunslet 0-4-0 'Britomart' crosses the small stream whilst indulging in a little shunting at Mynydd-yn-Bwlch. 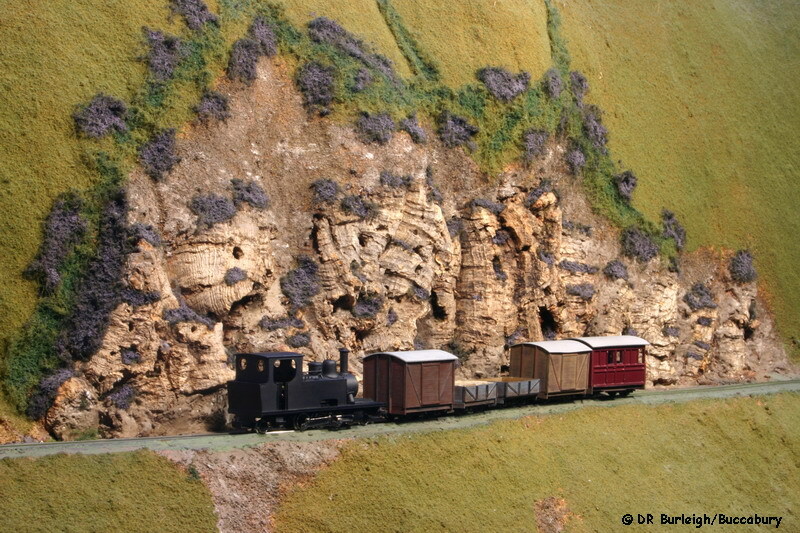 © DRB/Buccabury Stephen is one of the few people to have a go at producing a self-propelled 'gravity' slate train. 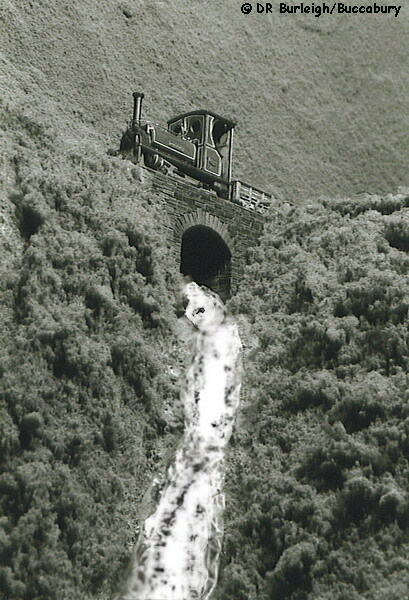 The power unit is built into a pair of slate wagons and it is seen here running downhill near Cefn Glas with a train. 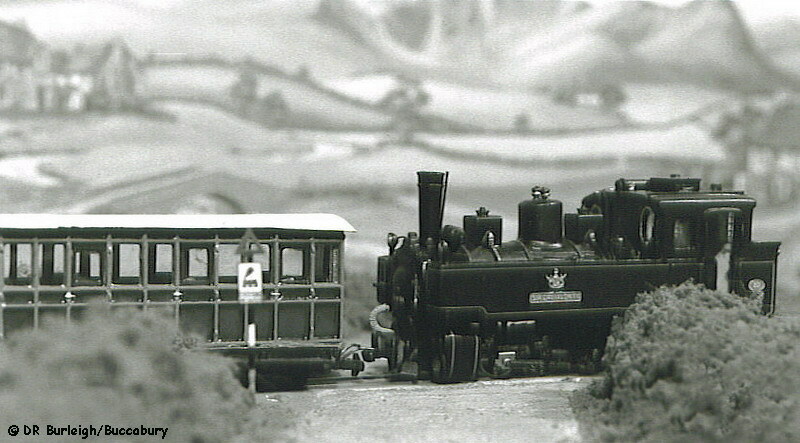 Unfortunately this pre-dated my production of loads for my own slate wagons. Andrew has been a very good, durable and reliable friend of mine for over a quarter of a century and as you can see is also a talented webmaster. He's the most regular visiting operator on the railway; our evenings generally last 6 hours with a sanity break somewhere in the middle, often finishing after midnight! With a phenomenal memory for detail, Andrew's also excellent at remembering those little operating foibles of the railway which I forget! Since the first recorded visit he's always brought locomotives along to run and he recently lent his entire collection to me so that I could photograph past visitors under ideal conditions and in typical situations. 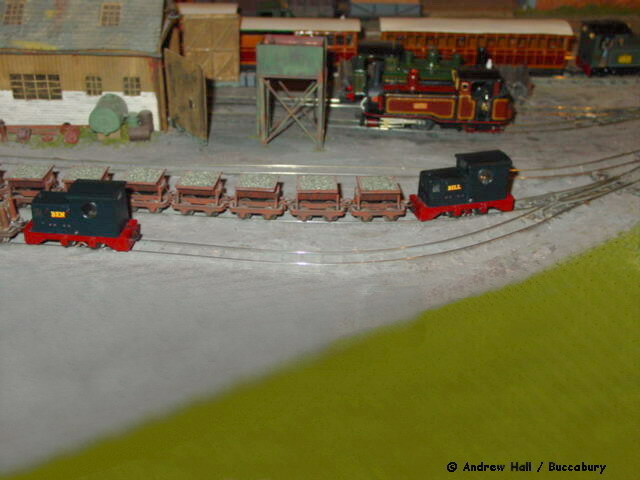 Andrew has collected a number of machines built by Paul Windle - for completeness I've noted their builder's numbers. 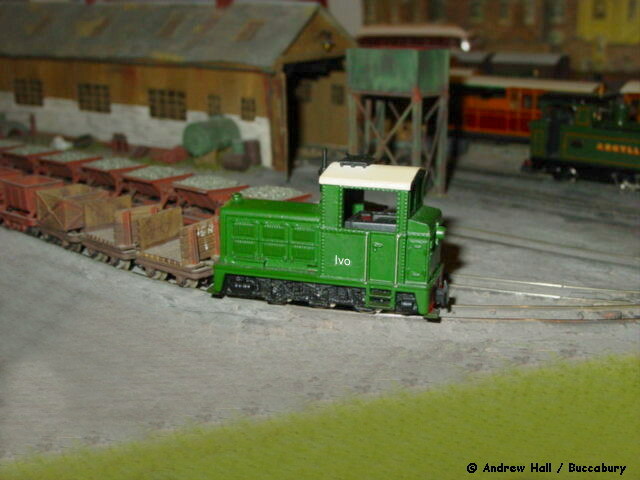 © AH/Buccabury During an evening running session, Andrew Hall's Roco diesel 'Ivo' prepares to leave Llanmynach yard with one of the works trains. 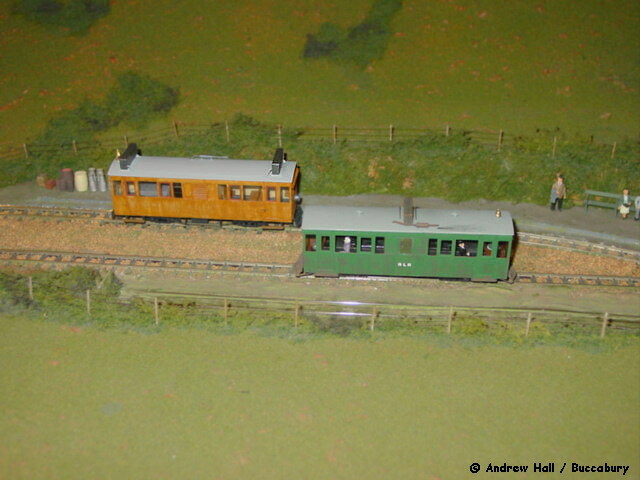 The wagon next to 'Ivo' is numbered JGF1. © AH/Buccabury Andrew's pair of Paul Windle Ruston 48DL diesels 'Bill' and 'Ben' indulge in a little shunting ballet at Llanmynach before setting off with their trains. © DRB/Buccabury The two Ruston & Hornsby 48DL diesels, 'Bill' (PW225/96) and 'Ben' (PW244/97) indulge in some necessary shunting at Llanmynach whilst the resident 48DL sulks in the siding. 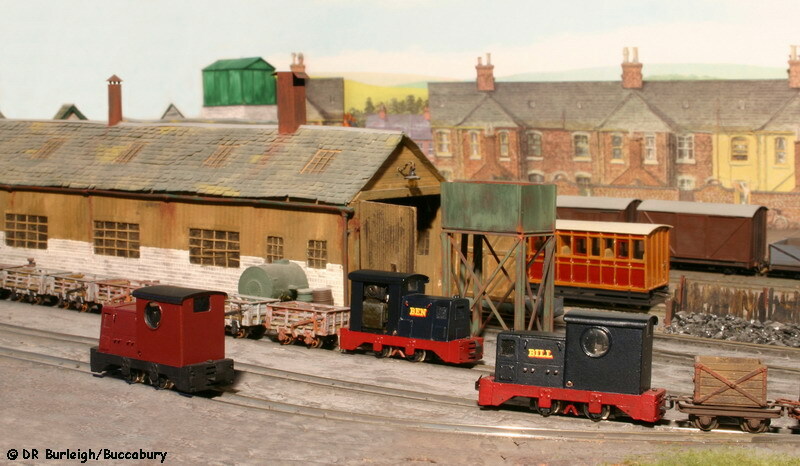 All three were built by Paul Windle. © DRB/Buccabury The F.C. 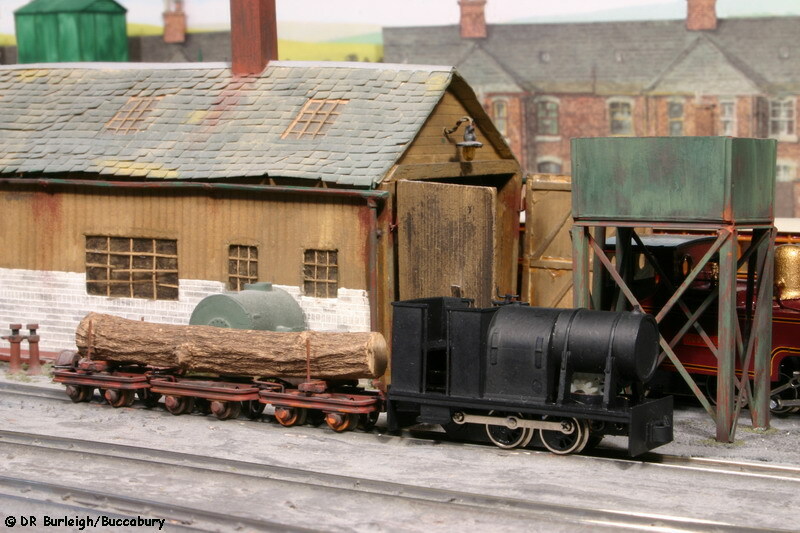 Hibbard 1934 Class petrol-mechanical 'Don' (PW296/97) trundles into Llanmynach yard with a works train. 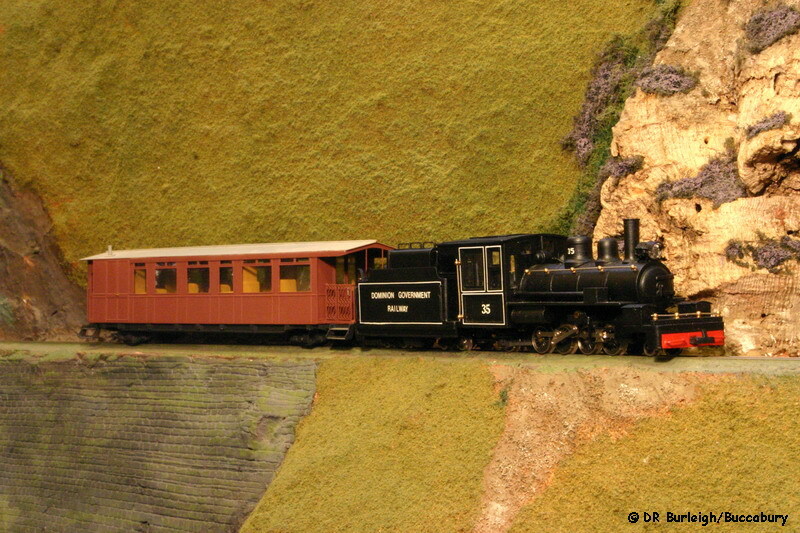 He was named after our good friend and fellow narrow gauge modeller, Don Boreham. © DRB/Buccabury Avonside Engine Co. Sezela Class 0-4-0T 'Elvira' (PW242/97) sizzles in the summer sun as she waits for another helping of coal from the pile. © DRB/Buccabury 'Eric' is a Bemo HF130C 0-6-0 diesel mechanical and has excellent slow running characteristics. Consequently he usually sees use as the Llanmynach station pilot and here can be seen making up a goods train for an afternoon departure. © DRB/Buccabury W.G. Bagnall 0-4-0 inverted saddle tank 'Fleur' (PW200/96) arrives at Rhyffedd Coed with the Talyllyn Railway set on a morning train to Mynydd-yn-Bwlch. © DRB/Buccabury From the standing start at Llanmynach, 'Isabel', a W.G. 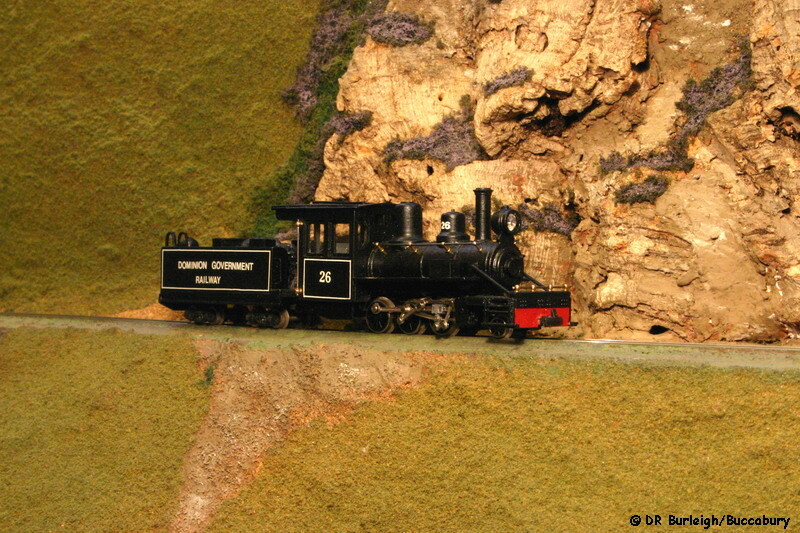 Bagnall Jessie Class 2-4-0T (PW175/96) lifts her heavily loaded afternoon tourist train up the grade through Tyddyn-Glas cutting. © DRB/Buccabury 'Ivo' is a Roco 6w diesel and is named after well-known photographer Ivo Peters. 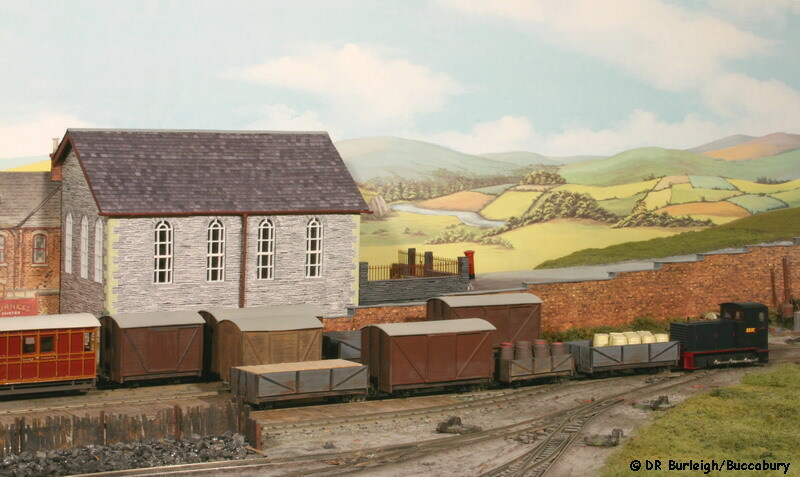 He very often sees service on ballast trains when he visits the L&TR and is seen shunt one such into the siding at Mynydd-yn-Bwlch. © DRB/Buccabury Kerr Stuart Haig Class 0-6-0T 'Sarah' (PW454/99) takes a breather at Rhyffedd Coed, having dragged a heavy train up from Llanmynach. 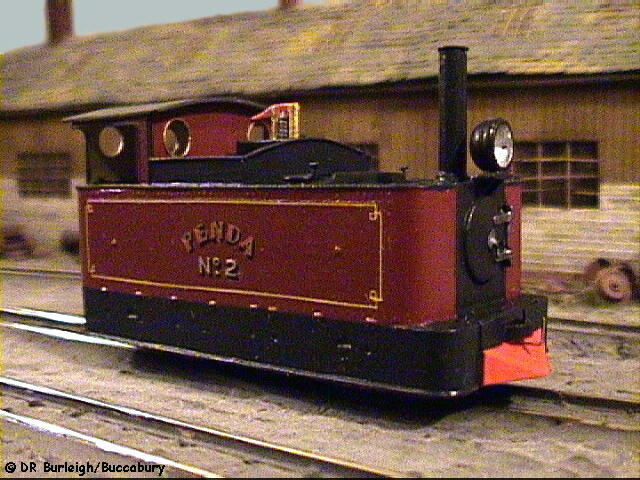 She appears to have had a name change because when she first visited the railway. The visitor's book shows she was originally called 'Jemima'. 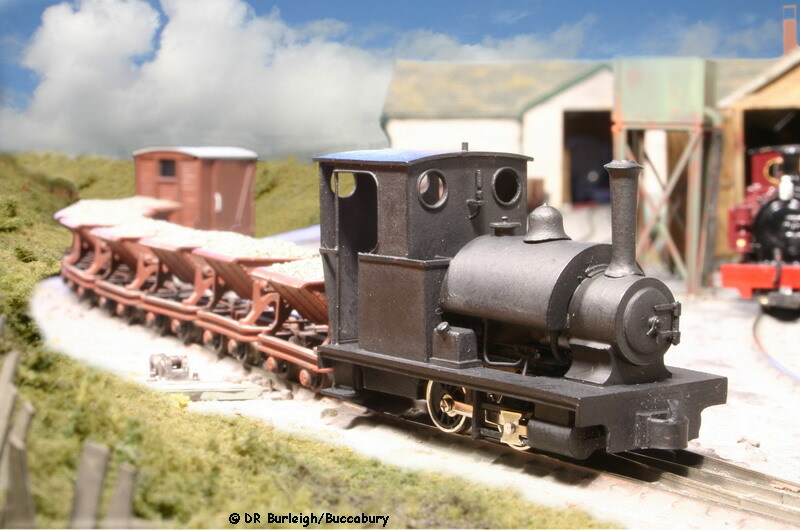 © DRB/Buccabury 'Luella' (PW199/96) is a very attractive and compact Andrew Barclay Penang Class 0-4-0 wing tank. She is seen here crossing the old drover's road after leaving Rhyffedd Coed on a late afternoon working from Tawel-Llety. © DRB/Buccabury With no up train to cross, Sharp, Stewart 0-6-0 Tram locomotive 'Prudence' (PW314/98) runs non-stop through Rhyffedd Coed with a down goods. The design for this machine was based on Clougher Valley practice. 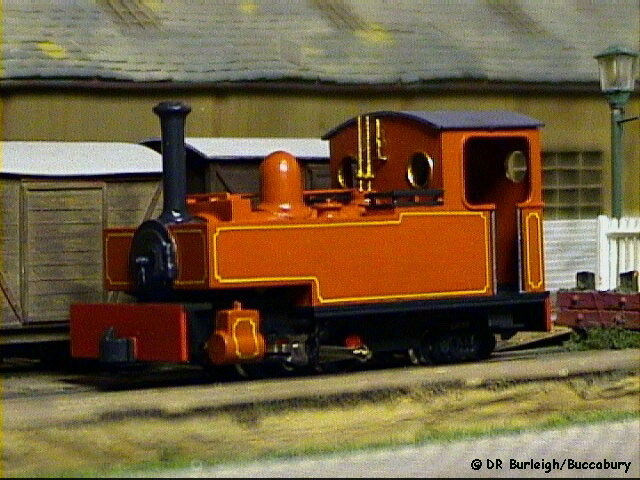 © DRB/Buccabury Sentinel 4w vertical boilered locomotive 'Rose' (PW860/05) awaits her next turn of duty on the loco road. © DRB/Buccabury On a warm summer afternoon Andrew Barclay A Class 'Shashi' (PW288/97) waits for time before departing with the 2:50 passenger train for Tawel-Llety. © DRB/Buccabury 'Bitsa' is a Fletcher Jennings 0-4-0 well tank of 1868 which was extensively rebuilt by the Isaac W. Boulton Co. being cabless it sees most use as a works loco where the crews find it easier to avoid the Welsh Sunshine! 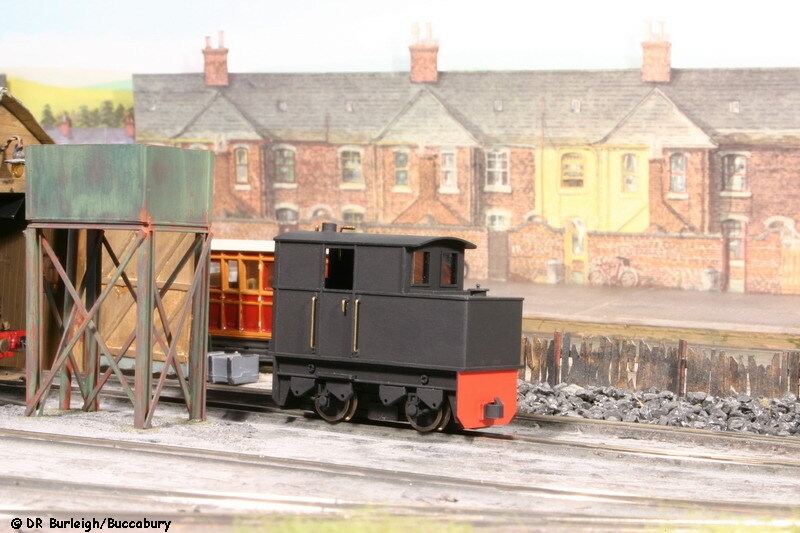 © DRB/Buccabury Another machine best used in the works is this Baguley 774 Class 0-4-0 Petrol Mechanical 'Charlie' (PW641/02), seen here gently ticking over on his own as his driver has gone off to find out what to do with the large piece of potential woodwork on the bolster set. 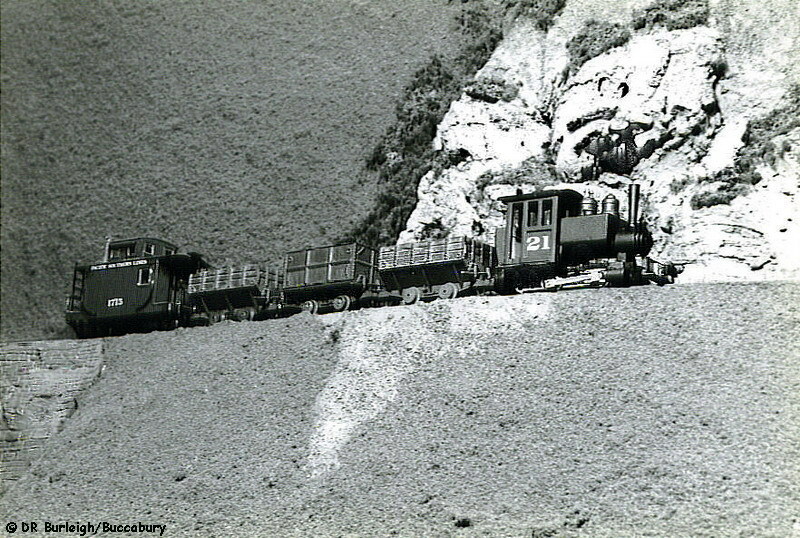 © DRB/Buccabury 'The Drewery', a Drewery 4w Diesel Mechanical railcar (PW794/04) emerges from the cutting above Rhyffedd Coed and trundles across the Sychnant viaduct on its way to Tawel-Llety. © DRB/Buccabury Seen from the lower end of the Bryn Mawr embankment, Hunslet 2-6-2T 'Lord Delpus' (PW457/99) returns to Llanmynach with a short goods train from Mynydd-yn-Bwlch. 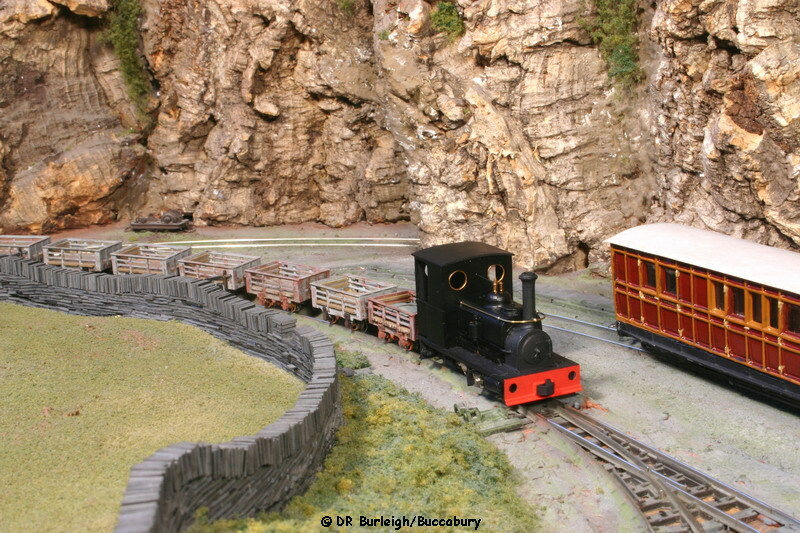 © DRB/Buccabury Hunslet Port Class 0-4-0ST 'Alice' (PW731/03) does what quarry Hunslets do best and bounces energetically through the loop line at Mynydd-yn-Bwlch with a train of slate empties for the mines. 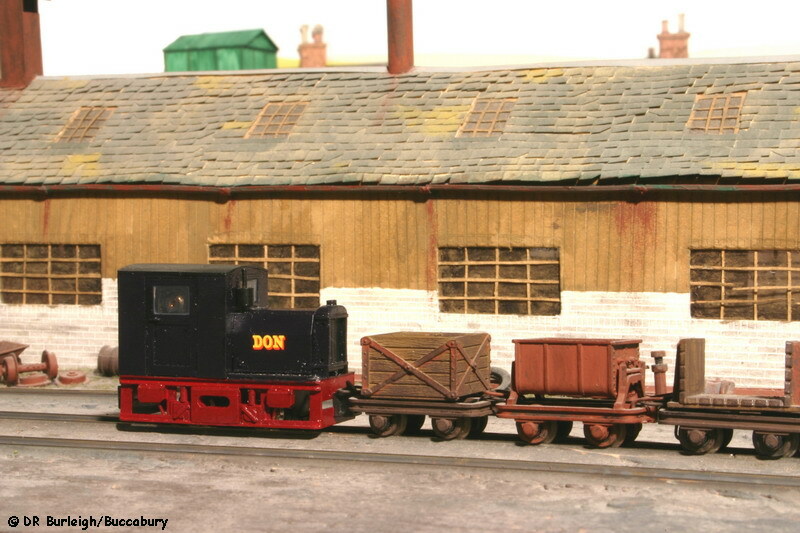 © DRB/Buccabury In Llanmynach yard, W.G. 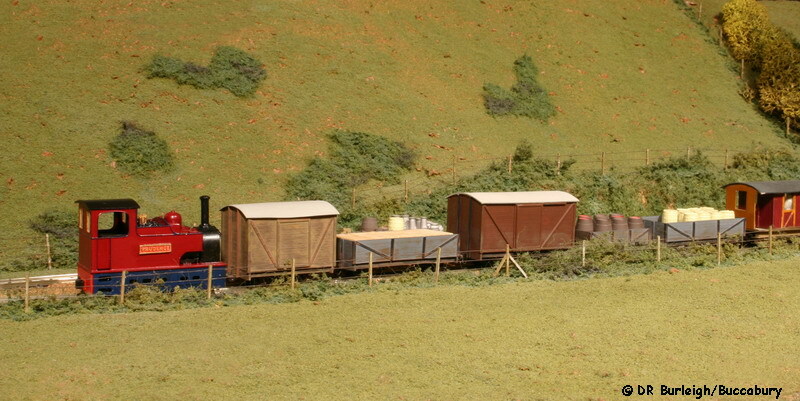 Bagnall Mendip Class 0-4-0ST 'Gertie' (PW634/02) simmers gently to herself in the bright sunshine while her crew waits for a clear road to take a trainload of ballast up the line for some track relaying. 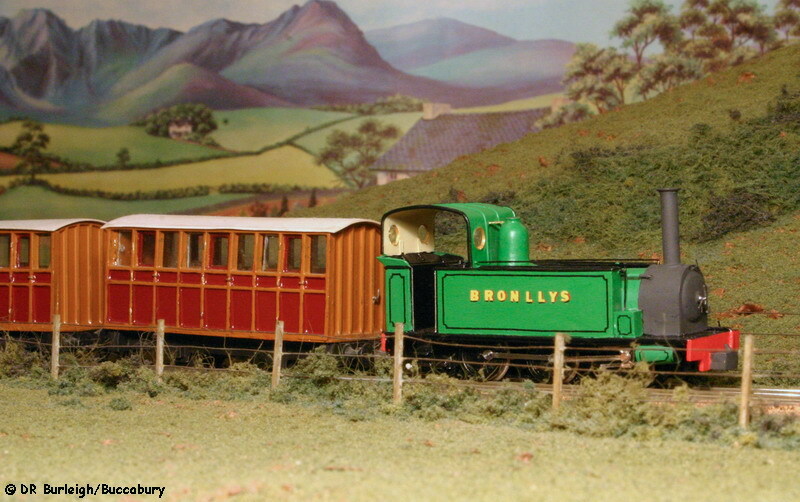 © AH/Buccabury The Parkside Dundas Welsh Highland 'Eisteddford' coach is ideally suited to rebuilding as a railcar and here the original version I built for the Buccabury Light Railway, in green, crosses one of Charlie Insley's interpretations in varnished teak, at Rhyffedd Coed. 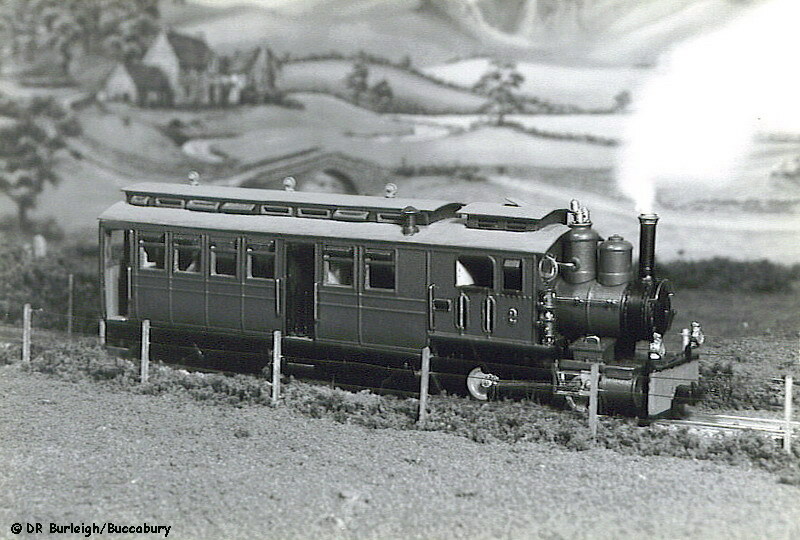 © DRB/Buccabury Penda, a heavily modified Peco Glyn Valley Tram loco with what appears to be a bit of Irish three-foot influence, simmers quietly in Llanmynach yard. 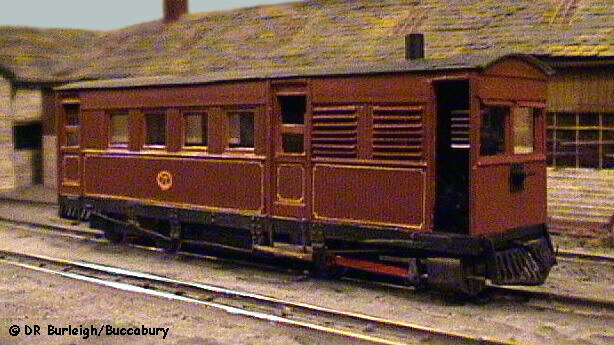 © DRB/Buccabury A modified Ashover coach with Sentinel overtones, the Vaenol Tramway's 0-4-0+4 recieves a service at Llanmynach before her next turn of duty. © DRB/Buccabury Godwin was originally called Gwen and is a Paul Windle built 0-4-4T based, via a somewhat tortuous route involving a previous 009 Chairman and an model featured in a 1961 Railway Modeller, on a Lynton and Barnstaple Railway locomotive. 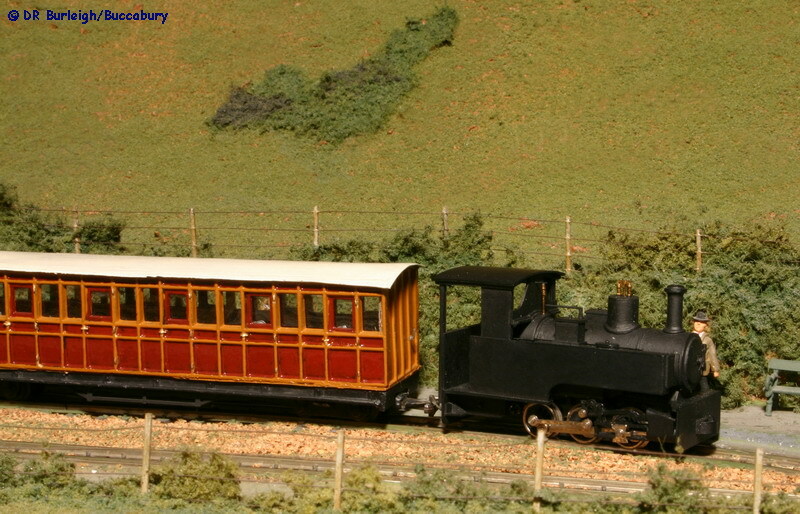 Godwin is seen here on Platform road 1 at Llanmynach before running to shed. © DRB/Buccabury Manning Wardle 2-4-0T 'Bronllys' takes a gentle stroll up the valley and enters the loop at Rhyffedd Coed with the set of Talyllyn coaches. 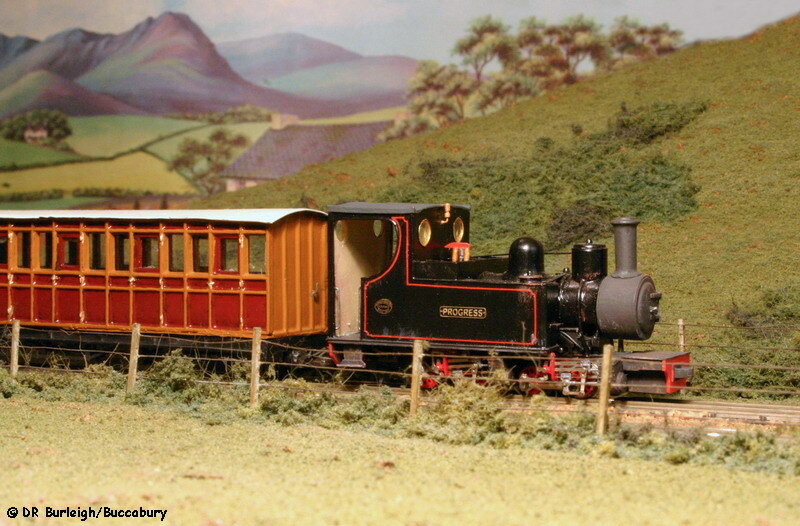 She is scratchbuilt in plasticard onto a reversed Dapol 48xx chassis with cylinders and connecting rods scrounged from the spares box and was inspired by Derek Naylor's recent OOn3 model of Devon/Nabb Gill (of the original Ravenglass & Eskdale Railway) with a dash of the Weston, Clevedon & Portishead Railway's Hesperus' thrown in. 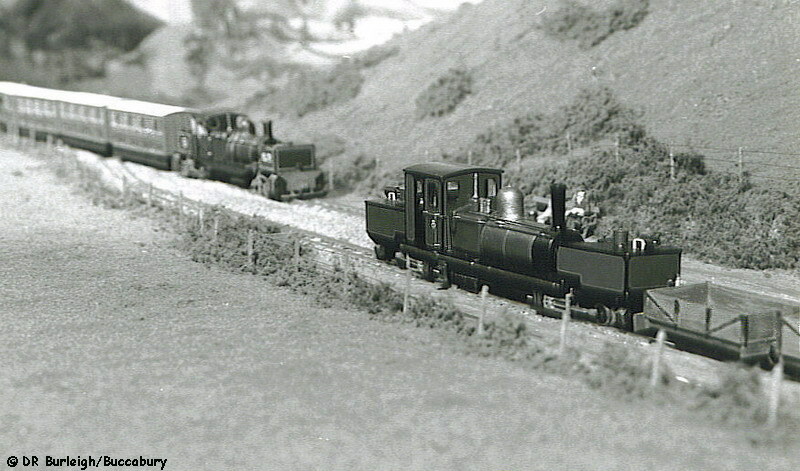 © DRB/Buccabury Hunslet-Mallet 0-4-4-0T 'Progress' drifts into Rhyffedd Coed with a passenger train for Mynydd-yn-Bwlch. 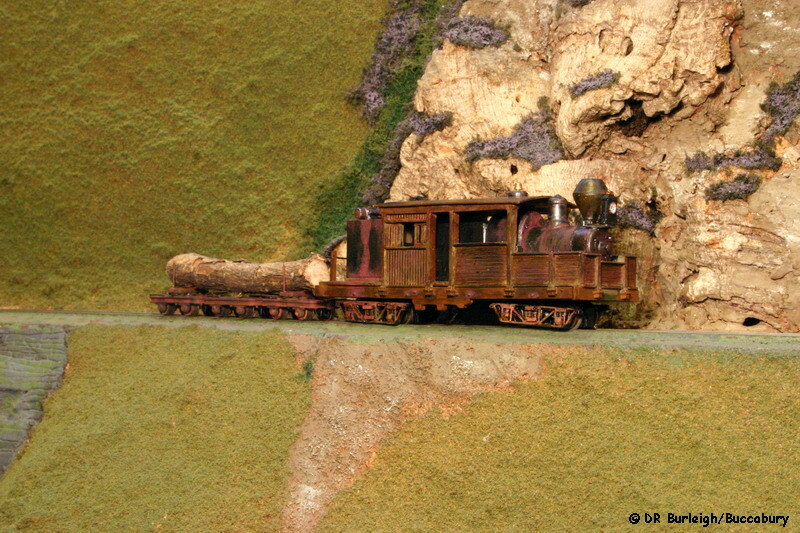 'Progress' is scratchbuilt onto a Minitrix Bavarian BBII 0-4-4-0 chassis. 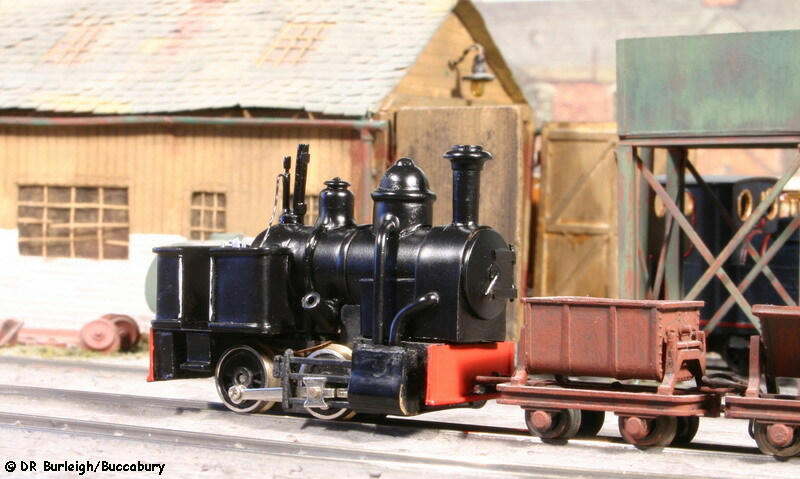 Although freelance, this is an interpretation of what Hunslets might have done with a small Mallet configuration and is one of the few articulated types which don't look too large on the L&TR. 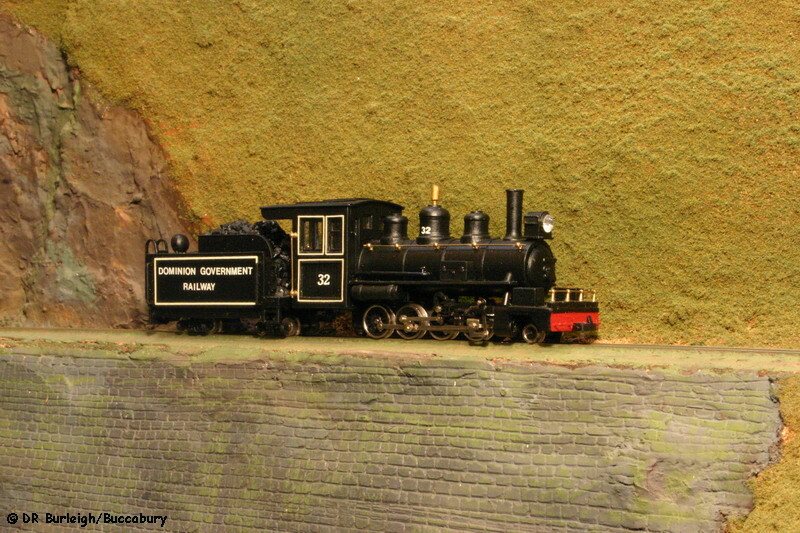 © DRB/Buccabury For one display, Brian lent me an entire collection of sugar cane railway models he'd build. 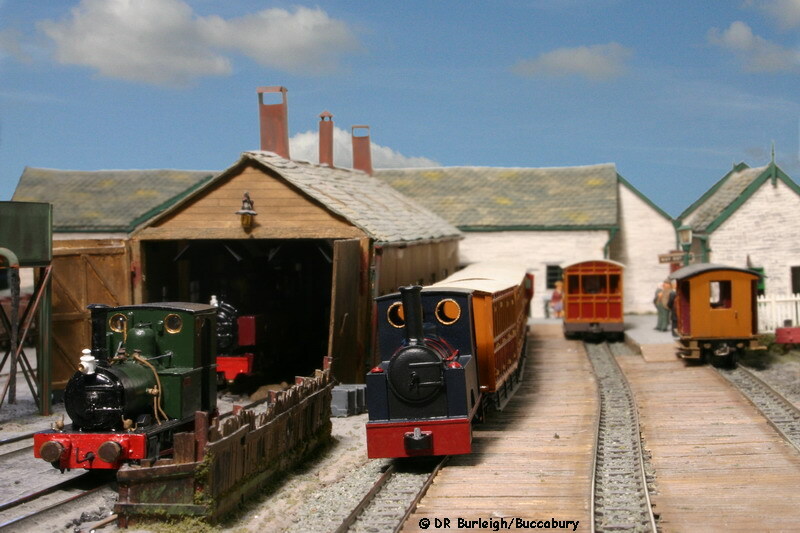 Most of the photos I took were studio shots but his superb rebuild of the Roundhouse Shay was so beautifully incongruous on the L&TR that I couldn't resist it. This view shows the Fabrica Sugar Co. no. 9, 2-truck Shay on shed at Llanmynach awaiting her next turn of duty which, due to the sheer size of the loco and the railway's loading gauge basically meant light engine to the road bridge and back! David is an art lecturer by profession and is the talent behind the excellent backscene which now graces our group layout 'Buccabury Town'. 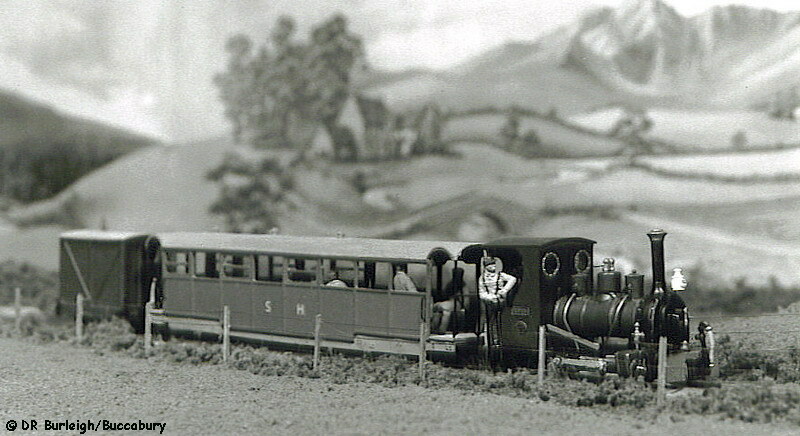 His prime interest is in colonial and overseas railways which means he can build and operate some large and in some cases rather esoteric items of rolling stock. 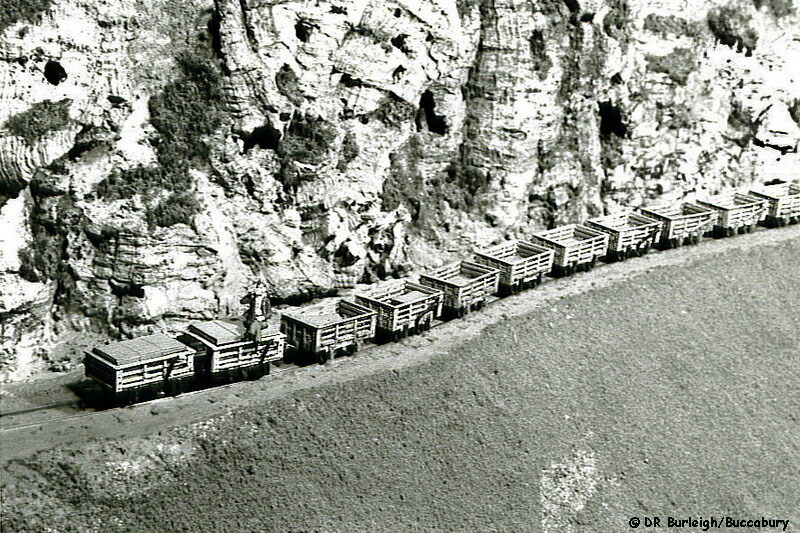 A Cuban built 'Rattletrap' railcar. © DRB/Buccabury This extraordinary 4-wheeled vehicle was used in Cuba to transport workers around the sugar estates. 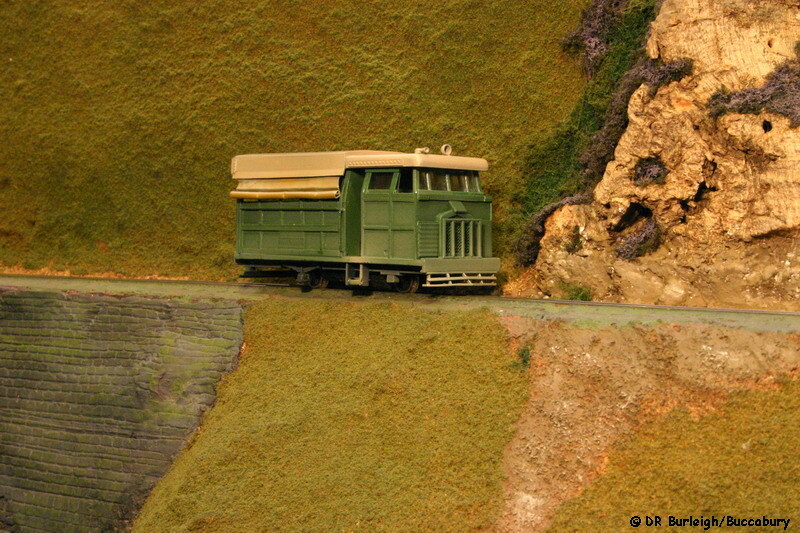 Known as the 'Rattle-trap', its basis was a Cummins diesel engined road truck. 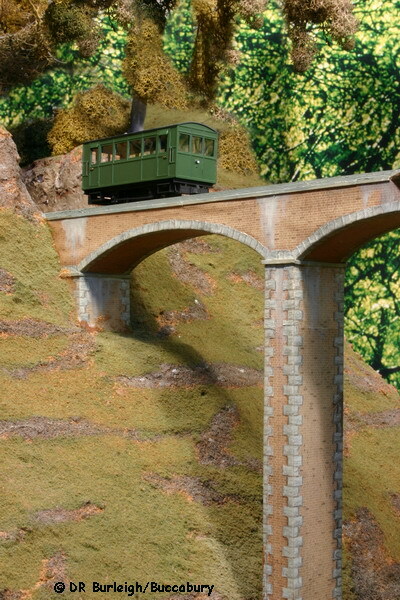 The model is built from styrene on a tram chassis and David has incorporated a piece on lead into the roof, thus giving it a high centre of gravity to ensure it rolls prototypically! It looks quite at ease as it bounces its was up towards Mynydd-yn-Bwlch. Garry is one of the founder members of the 009 Society and has twice held the position of Society Chairman. 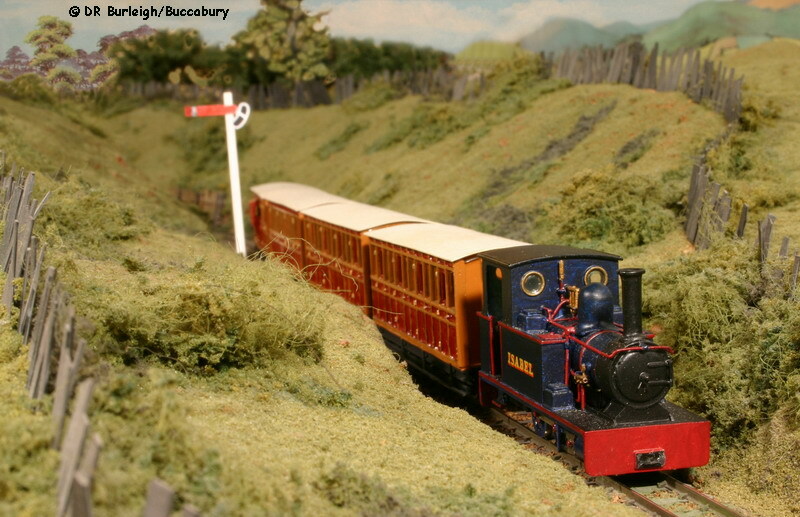 A talented modeller, able to transform a till-roll inner tube and a collection of fittings into a locomotive, Garry's prime interest is also colonial railways. For a number of years he has been assembling a stud of locomotives for his Dominion Government Railway system. © DRB/Buccabury Dominion Government Railways no.26, a 2-6-0 Baldwin running light engine under Cefn Glas. © DRB/Buccabury Dominion Government Railway 2-8-0 no.32 running light engine across Bryn Mawr. 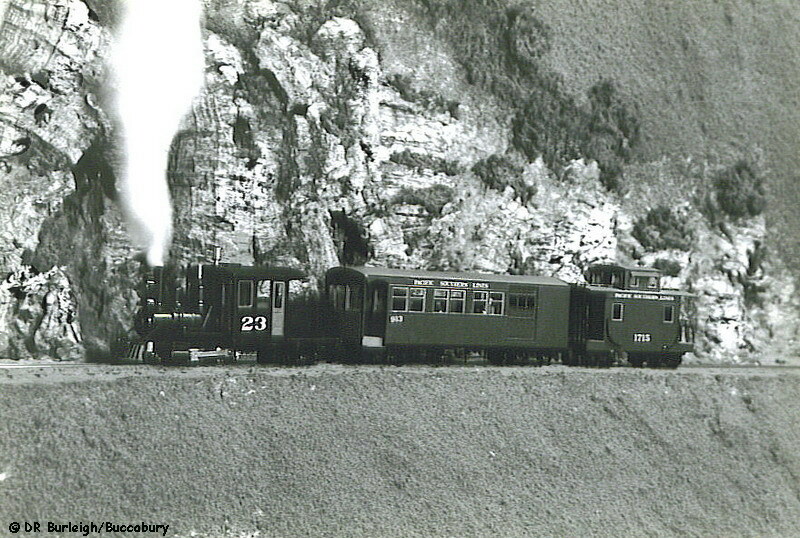 DGR 2-8-2 No.35 and a Leek & Manifold Railway coach. 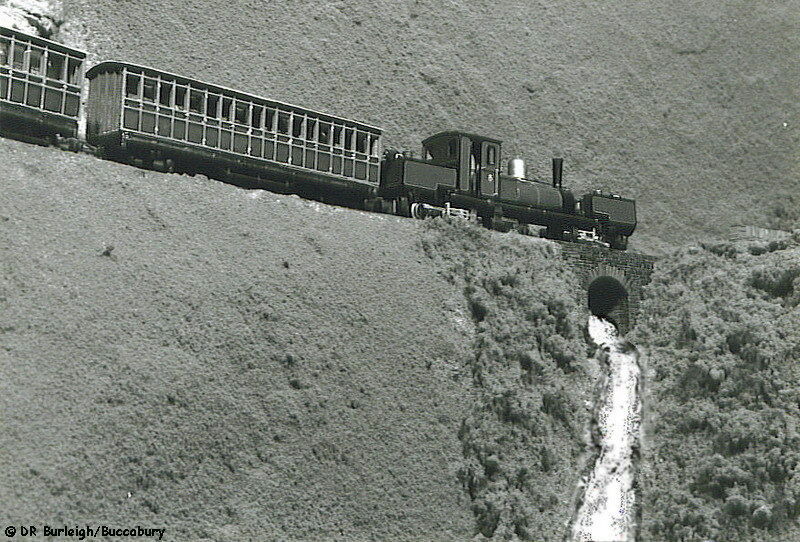 © DRB/Buccabury Dominion Government Railway 2-8-2 no.35 hauls David Gale's perfectly matched Leek & Manifold Railway composite coach uphill towards Mynydd-yn-Bwlch on a gauging run. © DRB/Buccabury A type 'A' Climax geared locomotive grinds, rattles and growls its way uphill with a relatively light load of one tree trunk.